GIRLS RALPH LAUREN JUMPER SIZE UK 6 CLR PINK MIX. Condition is Used. Dispatched with Royal Mail 2nd Class. Fine knitted, 100% cotton. Pretty Ralph Lauren Jumper.Excellent condition. No stains or tear. Size T4 - age 4 years. THIS IS A GIRLS RALPH LAUREN HOODIE STYLE CARDIGAN - SIZE 5. Authentic Ralph Lauren Bright Pink Cardigan And Bow Cardigan Aged 3 Yrs. This is a delightful easy to wear piece from Ralph Lauren. 100% authentic. Brand new with no tags. Brightens up any outfit, very versatile to wear with shorts, skirts, dresses and trousers. The famous logo is on the top left of the cardigan. Easy to wear buttons and long sleeve. The cute bow gives the cardigan an added girly touch to it. Would be a great gift. and perfect for all occasions. Small Petite. Cable knit. 100% cotton. With varsity appliqué. Gorgeous Ralph Lauren knitted girls swing cardigan . 'RALPH LAUREN'. Size on inside label : 3 years. Fibre Composition - 100% cotton. GIRLS RED RALPH LAUREN POLO NECK JUMPER AGED 8-9 YRS, GOOD CONDITION. Small white stain on back of jumper towards the bottom, been there practically since when it was bought. Still wearable and very comfy. Baby blue colour and thick material so can be worn during winter. Sizing is a small I would recommend ages 12/13/14, material is a bit stretchy which is why I recommend different ages. Ralph Lauren button up cardigan. Pit to pit 18.5”. Round neck. 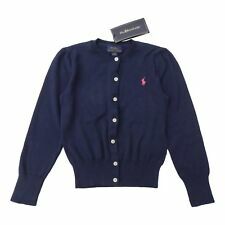 ralph lauren cardigan girls Age6. Condition is Used. Dispatched with Royal Mail 2nd Class. (STYLE: fleece jumper. Young girl's long sleeve top by the great fashion designer Ralph Lauren in size 4 years). a great gift for this season. RANGE: POLO. BNWT. GENUINE RALPH LAUREN IVORY CARDIGAN - AGE 12-14 YEARS - RRP £40. LIGHTWEIGHT CABLE DESIGN. CUTE PINK RALPH LAUREN MAN ON HORSE LOGO. BUTTON THROUGH DESIGN WITH RALPH WORDING ON EACH BUTTON. PERFECT WITH ANY SPRING DRESS. GRAB YOURSELF A BARGAIN. 100% COTTON. MACHINE WASHABLE. NWT Gorgeous rose pink sweater from Ralph Lauren. Super quality. cable design. Ribbed cuffs of sleeves and cuffs. Beautiful color. Age 4 years - Suitable for age 3 years to a small 4 years. (OCCASSIONALLY A LITTLE LONGER). Girls ’ navy blue Ralph Lauren rib knit cardigan with crew neck, cuffed sleeves, ruffled hemline and button closures at front. Machine washable. Designer: Ralph Lauren. Fabric: 100% Cotton. Genuine Ralph Lauren cable knitted cardigan. Colour: white cable knitted with a black embroidered pony logo, Ralph Lauren wording on all buttons, rib cuffs and waist. Size: size 5 (uk 4 yrs). Mary’s Designer Bargains. 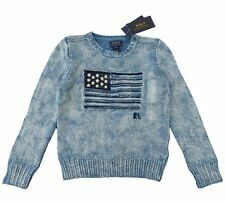 (Young girl's long sleeve sweater by the great fashion designer Ralph Lauren in size 2 years). a great gift for this season. soft 60% cotton 40% polyester in jet with snowflake design. Size: 7 years (eu 130cm) rrp: £115. girls RALPH LAUREN knit JUMPER in pure cotton. in light indigo blue with textured 2 tone flag on chest. garter stitch trim at shoulders and arm seams. seed stitch above ribbed cuffs & bottom. This beautiful 100% cotton made in Japan hooded cardigan with front Polo embroidery and a big logo at the back. Girls' purple Polo Ralph Lauren cotton cable knit sweater jumper with rib knit trim throughout, half button down zlosure. Hand wash only. Designer: Ralph Lauren. Color: Purple. Original Ralph Lauren 100% Wool sweater ,polo very warm. Overall length : 43 cm. We provide variety of clothes andaccessories and we feel honored to service you. Here we have a fantastic designer Ralph Lauren girls zip up cardigan, cable design. Size age 6 years. 100% cotton construction. Usual very high quality of construction and detailing you would expect from a Ralph Lauren product. Save ££s on RRP. Girls RALPH LAUREN knit JUMPER in soft luxury Pima cotton. in navy blue with pink embroidery pony on chest. knitted in fine gauge with double rib trim. colour: Newport Navy. Purple cardigan Pink cardigan with hood. Stylish Jumper by Ralph Lauren Polo new with labels attached. Two small pockets at the front and button down at the centre back which gives this Umper that little bit of special design. Quite chunky and textured. Girls navy cardigan by Ralph Lauren, knitted in fine gauge super soft luxury pima cotton. Ribbed striped neck, cuff and hem banding. Clear elastic stabilized shoulder seam. Drop shoulder. In very good used condition except minor signs of wear. Care label is cut out. 100% cotton loopback. 60% cotton, 40% polyester loopback. Neck, cuff and hem banding. Machine washable. In very good used condition except minor signs of wear and slight fabric pilling. Long raglan sleeve. Braid knit. 100% cotton jersey. Rib-knit neck, cuff and hemband ing. Embroidered pony at the left chest. In good used condition except minor signs of wear, slight fabric pilling and a bit faded color (see the picture gallery).